When I reviewed developer Kidalang’s Sage Fusion 2 ($2.99) a couple of years ago, I found a very satisfying story that was regrettably attached to a pretty terrible RPG. The story was strong enough to make it worth suffering through the questionable gameplay for, but wouldn’t it be better if we didn’t have to suffer at all? I’m not sure if it’s from feedback or simply recognizing their strengths, but Kidalang has gone a different way for their latest game, An Octave Higher ($6.99). 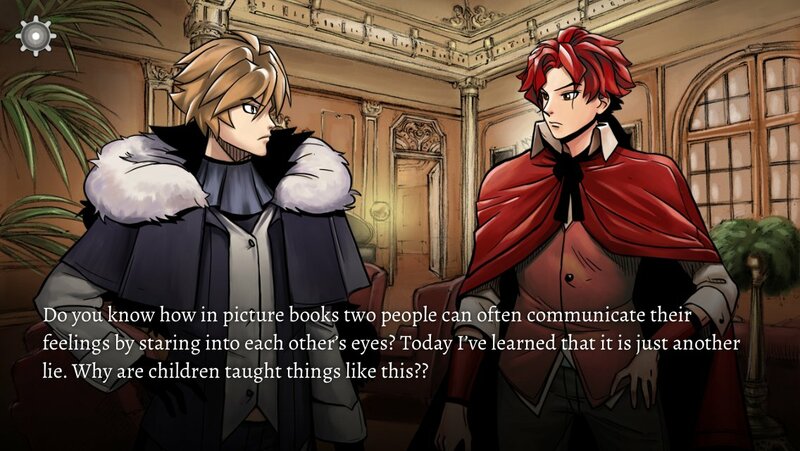 Rather than create another odd hybrid, the developer has opted to go with a fairly straight-up visual novel design. I think it was a very good choice, to be honest. While An Octave Higher isn’t an extraordinary example of the genre, it feels less like a broken experiment and more like a proper experience. 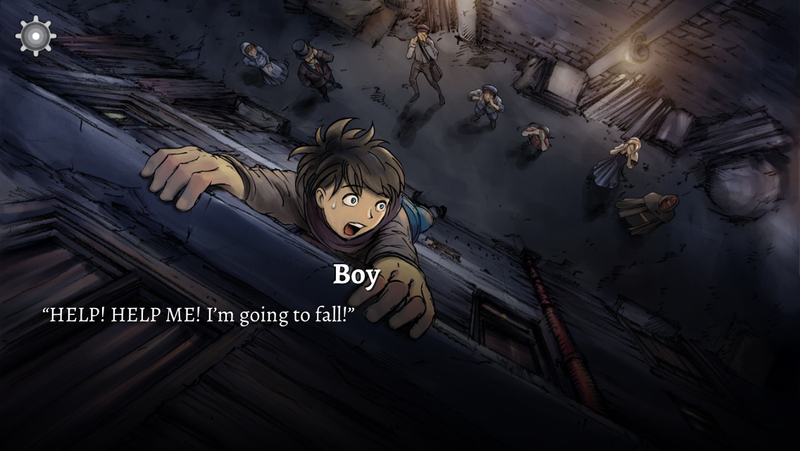 An Octave Higher is fundamentally a story about social classes. It dresses it up in the fantastic, using access to magic as a way of separating its classes, but this is a story about how circumstances can divide people. It wouldn’t take much work to drag the main plot out of the world of magic entirely. We experience this story through the eyes of three characters, each with a very different perspective on the world. There’s Frederic, an aristocrat brat who is pretty much awful to everyone he interacts with. Soon after, we meet Franz, a well-off student and researcher at the local university. The final piece of the puzzle is Elise, a young factory worker who lives at a brothel and in a few short months is expected to join the ranks, so to speak. The narrative jumps around between these three characters liberally. This style of story-telling is a bit hard to follow in places, but it does effectively convey what everyone is thinking about in any particular situation. 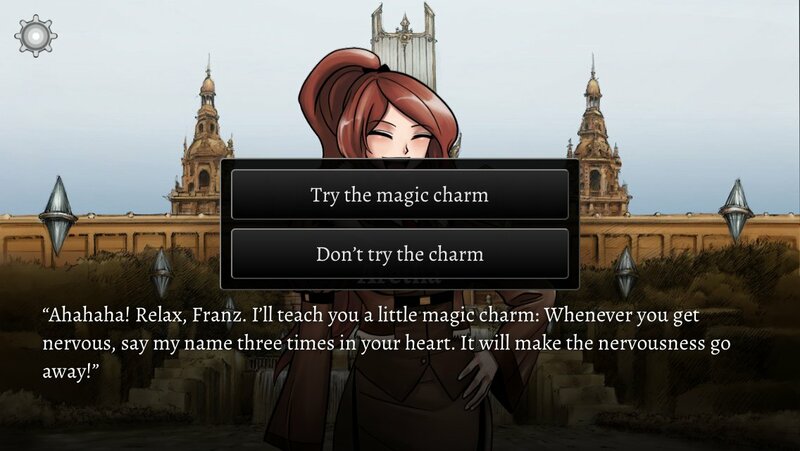 The first half of the main plot centers around Franz’s research into healing magic. In the world of the game, magic is used for just about everything from lighting the streetlamps to making tea. The city of Overture has refined magic to the point where it’s basically a science, creating machines that are powered by magical energy. Machines have been made that can automate use of all types of magic except for that of Compassion, which represents healing and restoring. Similarly, every type of magic can be successfully cast on inanimate objects save Compassion. When Franz’s professor assigns him to work on a project investigating this discrepancy, he resigns himself to failure until he happens across something quite unusual on an excursion on the wrong side of town. A factory worker, having finished her work for the day, heads around to the back of the factory where a broken piano sits. There, she casts healing magic on the piano in an attempt to restore it. For one brief second, both her and Franz can hear the piano before it stops working again. It’s enough to fire Franz up, and soon both Elise and Frederic are pulled into his research, the former as a subject, the latter as a sponsor. Not far behind the scenes, an uprising is brewing. You see, while just about anyone can use magic, only the rich can afford the mana potions that fuel it. 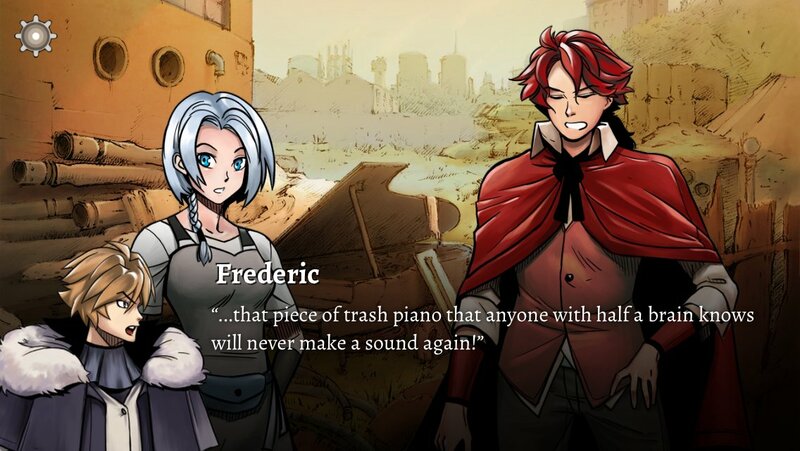 An Octave Higher doesn’t even attempt to be subtle about its inspirations. The haves are called the bourgeois, while the have-nots are called the proletariat. They live in separate parts of the city, and anyone crossing lines is going to run into some trouble. Some of the proles are starting to come together in a group called the Libertad, and you can be sure you’ll hear plenty from them by the end of the game. All of this chaos serves to feed the growing resentment between Franz and Frederic, with Elise caught dangerously in the middle of everything. How it all ends depends on the choices you make along the way. There are six different endings to uncover, though in true visual novel style, one of them is considered the true ending, if not the happiest. You’ll only get to make about a dozen or so choices through the course of the game, so there aren’t too many variables to keep track of, but getting the best ending might take you a few tries to puzzle out. As with Sage Fusion (Free)’s engaging take on religion, An Octave Higher doesn’t break new ground in the discussion about class division. That doesn’t stop it from being engrossing, of course, but its real success is in personalizing those struggles through the main cast. Frederic is, for lack of a better term, extremely entitled. He’s not used to being refused, and that makes him both frightening and pathetic in equal measures. Next to him, Franz seems positively down-to-earth, but he too has led a sheltered life. Elise has seen worse than both, but somehow is the most naive of the bunch. The writing manages to give each of these three a very distinct voice, and it’s pretty fun to see how different eyes view the same scenes. The story is at its best when it’s unfolding the twisty roads these three navigate throughout the story. The supporting cast is also very strong, and the writing nicely conveys the gray areas of morality that make this topic so complicated in real life. The members of the Libertad have a just cause but pursue it through brutal means. The more well-off members of the cast are as guilty as anyone of standing on the backs of the poor, but they’re quite oblivious to it. All sides are likable yet monstrous at once. Unfortunately, as outstanding as the character work and overall plot both are, the writing spends an awful lot of time building unnecessary lore and explanations. A little bit would have gone a long way here, but particularly in the first half of the game, things are constantly slowing down to explain irrelevant things in excruciating detail. Worse still is that since the entire story is told from a first-person point of view, each of these moments requires a character to deliver absolutely bizarre exposition. The writing is smooth about it a couple of times, but for the most part it comes down to someone suddenly explaining at length how some mundane device or aspect of the world works to another person who either already knows or has shown no indication of caring. This makes the first third or so of the game a lot slower than it needed to be. Happily, once you hit the climax of the story, the exposition almost completely stops and the story is free to grip you for the duration. As is typical for the genre, there’s artwork to collect and a gallery where you can view it whenever you like. You can also fast forward the story, which is useful when you’re hunting down alternate endings. The artwork shows a clear improvement over the Sage Fusion games, though it enjoys the benefit of not needing to animate much or render its characters in super-deformed style for discrete battle scenes. There’s also a good selection of lovely music to accompany the story. While some of the music and just about all of the sound effects get a bit repetitive by the end, I’m mostly happy with the audio presentation in An Octave Higher. Running through the optimal path should take four or five hours, depending on how quickly you read, with the pursuit of additional endings adding a little more time on top of that. It’s not the longest visual novel I’ve played, but I think it’s long enough to tell its story. Looking at the whole picture, An Octave Higher has an excellent plot, generally good writing, and interesting characters. It’s a bit too in love with explaining the admittedly carefully designed rules of its own world at times, and the majority of the endings are really weak. Also, it doesn’t really do anything special or exciting with the visual novel format, so if you’re not down with a whole lot of reading and a very little bit of decision-making, you’re not going to be too thrilled here. That said, if you’re looking for a visual novel that doesn’t pivot around romancing other characters, An Octave Higher is a strong example among admittedly slim pickings on iOS. I find myself once again strongly recommending a Kidalang story, and I look forward to experiencing more of their adventures in the future.